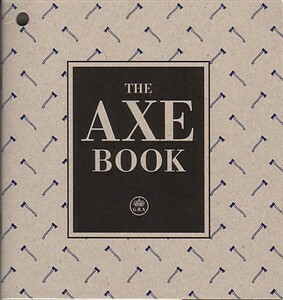 The Axe Book contains information on axes. Which axe should I choose? The Axe Book, produced by Gransfors Bruks, gives new axe owners a leg up on the old craft of axemanship as well as several other basic living skills which are becoming increasingly rare in the modern urban world. At the Gransfors Bruks facility in Sweden, modern craftsmen hand forge today's versions of many useful but now rare axe designs. Yesterday's standards apply to their work, with no product receiving the individual maker's mark until the smith is happy with it. To prevent unskilled new owners from immediately wrecking these fine tools, Gransfors Bruks developed The Axe Book, a simple manual of essential knowledge about axes and related activities like building fires, splitting and drying firewood, and operating wood stoves. A book like this could be boring and derisive, but the authors relate the critical information simply in a way that any novice or opinionated expert can understand and enjoy. Their book does include some self marketing, but even that is a welcome glimpse into a company that actually still does things the right way. If you buy an axe from Gransfors Bruks, you get The Axe Book in print format free of charge. The printed book also is available at Amazon, but if you simply need the knowledge, download the PDF version for free from the Gransfors site online. Gransfors Bruks also offers a companion PDF volume, The Ancient Axe Book. This short history of axes and axe craft in Northern Europe includes sketches and explanations of the many wood-chopping or head-lopping axes which inspired the replica weapons featured on OnlyKnives. If you play video games, you'll already know a surprising number of the book's archaic terms.